The Weber Q1200 gas grill has everything you need when you’re cooking on your apartment balcony. It has a stainless steel burner that emits about 8500-BTUs per hour; heating up the 189-square inch cooking area quickly. You can easily control the grill’s heat because of the easy-start electronic ignition, as well as the burner valve controls. The ignition will start the grill up within a matter of minutes, and the valve controls will allow you to adjust the temperature to your liking. One of the biggest advantages of the Weber Q1200 is that is comes fully assembled right out of the box. No need to waste time putting the grill together while reading instructions that never seem to make sense. 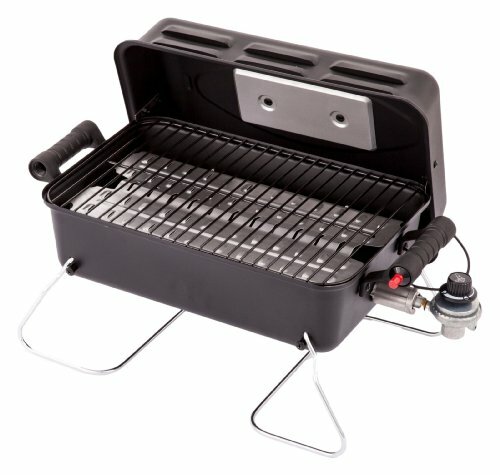 All you have to do is take the grill right out of the box and connect it with a propane cylinder. This grill is also available in a variety of colors, including black, fuschia, blue, green, orange, and silver. This grill can be used directly on the ground or with a small table, depending on your preferences. 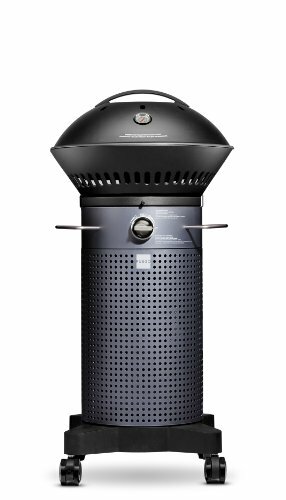 Overall, this grill is at #1 on the list because it has a very convenient size for an apartment balcony and provides more than enough heating power to cook for a full family. The Cuisinart CGG-240 won’t take up much space on your apartment balcony but will easily cook food to the right temperature. This tabletop gas grill has a stainless-steel burner that will provide up to 15,000 BTU’s on the porcelain enamel-coated cast-iron cooking grates. The stainless steel finish is easy to clean and will avoid rusting. Starting up the gas grill is a straightforward process. All you have to do is use the Twist-Start electric ignition and watch the grill start up. The temperature gauge is conveniently located on the lid so that you can monitor the temperature of the grill. For an average sized balcony, the CGG-240 is best used with the stand. 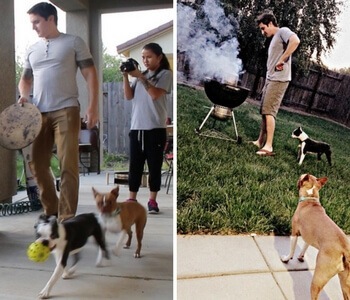 The grill can be purchased separately as a tabletop grill, but having the stand would make it much easier to cook your food on the balcony while standing or sitting. Having a stand would also save space as you wouldn’t have to find a small table to hold up the tabletop version. The Char-Broil Portable Gas Grill Deluxe is perfect for anyone who wants a nice burger but has minimal space on their balcony. The cooking surface consists of 190-square inches; not the biggest space on the list but just enough to cook a few hamburgers at once. With the help of either a 14.1-ounce or 16.4-ounce propane cylinder, the grill’s burner will disperse 11,000-BTU’s onto the cooking platform so that you can cook your food at a fast pace. The firebox is made with a high quality rust-resistant steel that will elongate the lifespan of the grill. This will make it easier to leave outside during harsh weather conditions if you choose, although the lightweight nature of the grill and small size will make it virtually effortless to store the grill in a closet or kitchen cabinet. Speaking of storage, when you’re done using this grill, the metal legs that create a sturdy platform for the grill will fold over the lid; locking it in place. The heat-resistant handles allows you to transport the grill almost immediately and put it away wherever you would like. If you don’t have much to spend, this gas grill is a great choice. You can easily spend less than $50 on this grill, although you will have to consider the price of the propane cylinder. This is very reasonable for a grill that cooks food evenly without much hassle. If you want a traditional stationary grill, you will be pleased with the Char-Griller 3001. This grill can emit well over 40,000 BTU’s onto the 438-square inch main cooking area. Included with this large amount of cooking space is a 192-square inch warming rack, as well as a 12,000-BTU side burner that will help you cook plenty of food at once. The durable steel construction will avoid rust from accumulating over time. There is also a side shelf on each side of the grill for an organized work space that can be used to prepare food and let the food cool down after being on fiery cast-iron grates. Just because this grill has a large frame doesn’t mean it isn’t mobile when it needs to be. There are two wheels on the left side that can help you easily take it from one place to another, although you probably won’t need to move the grill much since you’ll be on an apartment balcony. Keep in mind that this frame is larger than some of the other options, but it should still fit on most apartment balconies. Designed by the former Chief Designer at Apple, the Fuego Element gas grill has an innovative shape that will make cooking on your balcony that much easier. This narrow gas grills heats up to 500-degrees Fahrenheit in approximately 5 minutes; which is astounding for any type of grill. 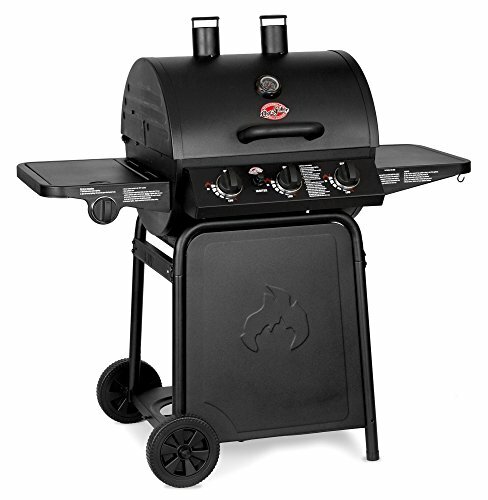 This grill’s patent pending dual zone burners push for high efficiency; with a single fuel tank lasting at least 20 hours. Cleaning won’t be an issue either, thanks to the residue tray that simply collects the food residue while you’re cooking. The 15-pound Fuel Element grill has a durable porcelain-enamel cast iron grate that is easy to clean and provides the perfect sear to any type of meat with temperatures ranging from 250-degrees Fahrenheit to 500-degrees Fahrenheit. There is about 346-square inches of primary cooking area available; enough space to cook roughly 16 quarter-pound hamburgers at one time! This is perfect for large families that want to enjoy the good weather on the apartment balcony. A unique feature of this grill is the hinged door that is used for propane tank storage. No more having to lug around a huge, heavy propane tank, just store the propane underneath the grill. In addition, the impressive anti-lock wheels will ensure that the grill will stay in one spot. Before going out and spending money on a new grill for your balcony, the first thing you should do is consult with your property management or landlord to make sure that you are allowed to use a grill. Good to go? Great. The gas grill you purchase will ultimately come down to the size of your apartment balcony. The size of your balcony may determine the size of your gas grill. 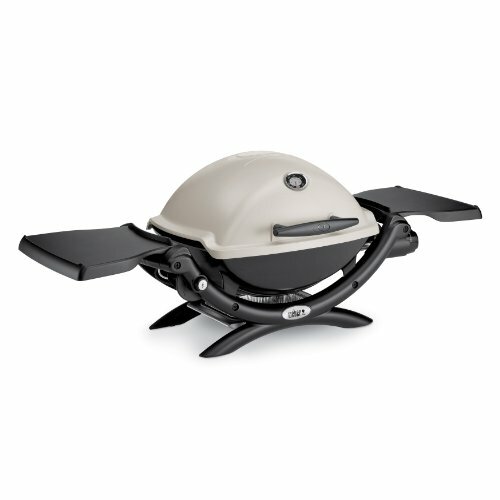 If you have a lot of space available, a larger grill like the Char-Griller 3001 Grillin’ Pro would suffice. Most of the time, people have limited space throughout their apartment balconies, so buying a compact gas grill makes the most sense. The Fuego Element grill and the Char-Broil portable gas grill are the epitome of small gas grills that can fully cook high quantities of food without taking up a lot of space. The remaining grills on the list: the Weber Q1200, the Cuisinart CGG-240, and the Char Griller 3001 Grillin’ Pro are larger grills, but they offer buyers a stable platform to cook their food with. Unlike the two grills mentioned earlier in this section, these grills have side shelves that can help with food preparation. You can place food, seasoning, and even drinks on the side shelves and keep things organized as you’re ready to get the grill started. Every balcony is a different size, some bigger than others. It’s your responsibility to find the right sized grill that will satisfy your craving for grilled foods without harming yourself or those around you. While cooking, one must be conscious of the smoke and/or odors that typically occur with grills. The last thing anyone wants is an irritated neighbor upstairs who is overwhelmed with a strong smoky smell. Along with the overall size of the grill, remember to consider the cooking surface and extra features, such as portability and easy-start ignition. Cooking on your apartment balcony with a gas grill will let you enjoy your view of the outside while getting ready to eat some quality food. Learning about the pros and cons of having a gas grill will make it easier to make the right selection. What are the benefits of using a gas grill opposed to other types of grills? Compared to charcoal and electric grills, gas fueled grills tend to start up much faster and cook food quite evenly. Grills that have a large surface area with high amounts of BTU’s per hour will be able to cook a large quantity of food in a short period of time. Unlike grills that use wood or charcoal, gas grills will start almost instantly, though they can still take a little while to heat up. There will be a few instances where you won’t be able to bring your grill into storage, resulting in you leaving it outside on the balcony. Depending on where you live, this can shorten the overall lifespan of the grill. If this applies to you, it’s important to make sure that your potential gas grill is made with durable material so that it can handle the rigors of being exposed to poor weather conditions such as rain or snow. Grills made with a stainless steel material such as the CGG-240 will be able to avoid rusting by any means, keeping your grill fresh. Ease of storage, thus increasing lifespan of the grill is one reason why some folks choose electric grills for apartments. Another advantage of a gas grill is that some apartments will not allow an open flame on their balconies. In these situations, you'll need a gas-powered appliance. While gas grills can do some great things on an apartment balcony, there are a few potential issues to consider when using these grills outside your living space. The biggest danger to using a gas grill near your apartment is the release of carbon monoxide. This should encourage you to be very careful when using a propane-fueled grill and to make sure that it is shut off when you are finished using it. Carbon monoxide poisoning can be fatal for you and your family members and/or roommates, so it is crucial to always check the grill when turning it off. Other issues that some people have with gas grills is that it doesn’t directly aim the heat towards the meat on the grill like infrared grills. This is not a major issue, but it may take a few minutes longer to cook large quantities of food. The issues discussed shouldn't keep you from getting a gas grill, as they do have their strengths, such as ease of use and affordability – which is part of the reason that they're the perfect addition to your apartment balcony!